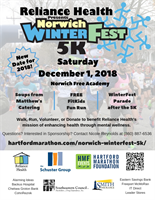 Reliance Health is teaming up with the Hartford Marathon Foundation for their 6th annual Norwich WinterFest 5K and Free FitKids Fun Run. All runners receive swag bags, long sleeved shirts, and soup from Matthew's Catering. The race is open to both walkers and runners at all fitness and experience levels – a fun family event to get moving and active! Proceeds from the race will support Reliance Health's mission of enhancing health through mental wellness. Join in for a fun morning to kick off the holiday season while supporting a local nonprofit.